"Riparian" redirects here. For the legal doctrine, see riparian water rights. Not to be confused with Ripuarian language. Riparian zones may be natural or engineered for soil stabilization or restoration. These zones are important natural biofilters, protecting aquatic environments from excessive sedimentation, polluted surface runoff and erosion. They supply shelter and food for many aquatic animals and shade that limits stream temperature change. 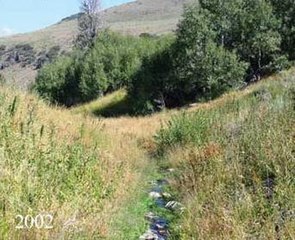 When riparian zones are damaged by construction, agriculture or silviculture, biological restoration can take place, usually by human intervention in erosion control and revegetation. If the area adjacent to a watercourse has standing water or saturated soil for as long as a season, it is normally termed a wetland because of its hydric soil characteristics. Because of their prominent role in supporting a diversity of species, riparian zones are often the subject of national protection in a biodiversity action plan. These are also known as a "Plant or Vegetation Waste Buffer". Research shows that riparian zones are instrumental in water quality improvement for both surface runoff and water flowing into streams through subsurface or groundwater flow. Riparian zones can play a role in lowering nitrate contamination in surface runoff, such as manure and other fertilizers from agricultural fields, that would otherwise damage ecosystems and human health. Particularly, the attenuation of nitrate or denitrification of the nitrates from fertilizer in this buffer zone is important. The use of wetland riparian zones shows a particularly high rate of removal of nitrate entering a stream and thus has a place in agricultural management. Riparian zones dissipate stream energy. The meandering curves of a river, combined with vegetation and root systems, slow the flow of water, which reduces soil erosion and flood damage. Sediment is trapped, reducing suspended solids to create less turbid water, replenish soils, and build stream banks. Pollutants are filtered from surface runoff, enhancing water quality via biofiltration. The riparian zones also provide wildlife habitat, increased biodiversity, and wildlife corridors, enabling aquatic and riparian organisms to move along river systems avoiding isolated communities. 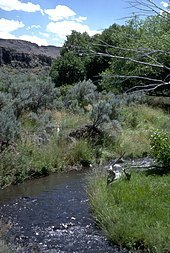 Riparian vegetation can also provide forage for wildlife and livestock. Riparian zones are also important for the fish that live within rivers, such as brook and charr. 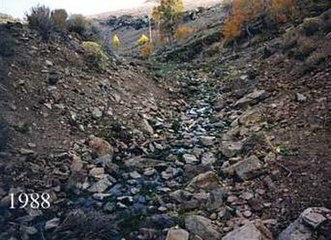 Impacts to riparian zones can affect fish, and restoration is not always sufficient to recover fish populations. They provide native landscape irrigation by extending seasonal or perennial flows of water. Nutrients from terrestrial vegetation (e.g. plant litter and insect drop) are transferred to aquatic food webs. The vegetation surrounding the stream helps to shade the water, mitigating water temperature changes. The vegetation also contributes wood debris to streams, which is important to maintaining geomorphology. From a social aspect, riparian zones contribute to nearby property values through amenity and views, and they improve enjoyment for footpaths and bikeways through supporting foreshoreway networks. Space is created for riparian sports such as fishing, swimming and launching for vessels and paddlecraft. The riparian zone acts as a sacrificial erosion buffer to absorb impacts of factors including climate change, increased runoff from urbanization and increased boat wake without damaging structures located behind a setback zone. The protection of riparian zones is often a consideration in logging operations. The undisturbed soil, soil cover, and vegetation provide shade, plant litter, and woody material, and reduce the delivery of soil eroded from the harvested area. Factors such as soil types and root structures, climatic conditions and vegetative cover determine the effectiveness of riparian buffering. The assortment of riparian zone trees varies from those of wetlands and typically consists of plants that are either emergent aquatic plants, or herbs, trees and shrubs that thrive in proximity to water. In Asia there are different types of riparian vegetation, but the interactions between hydrology and ecology are similar as occurs in other geographic areas. Land clearing followed by floods can quickly erode a riverbank, taking valuable grasses and soils downstream, and later allowing the sun to bake the land dry. Natural Sequence Farming techniques have been used in the Upper Hunter Valley of New South Wales, Australia, in an attempt to rapidly restore eroded farms to optimum productivity. The Natural Sequence Farming technique involves placing obstacles in the water's pathway to lessen the energy of a flood, and help the water to deposit soil and seep into the flood zone. Another technique is to quickly establish ecological succession by encouraging fast-growing plants such as "weeds" (pioneer species) to grow. These may spread along the watercourse and cause environmental degradation, but may stabilize the soil, place carbon into the ground, and protect the land from drying. The weeds will improve the streambeds so that trees and grasses can return, and later ideally replace the weeds. There are several other techniques used by government and non-government agencies to address riparian and streambed degradation, ranging from the installation of bed control structures such as log sills to the use of pin groynes or rock emplacement. ^ Sievers, Michael; Hale, Robin; Morrongiello, John R. (March 2017). 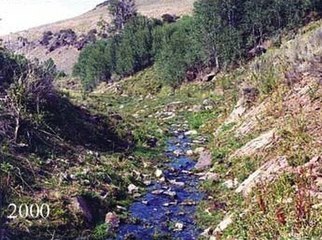 "Do trout respond to riparian change? A meta-analysis with implications for restoration and management". Freshwater Biology. 62 (3): 445–457. doi:10.1111/fwb.12888. ^ "List of trees and plants". Archived from the original (xls) on July 18, 2011. Retrieved 2010-09-29. ^ a b Cooke, Sarah Spear (1997). A Field Guide to the Common Wetland Plants of Western Washington and Northwestern Oregon. Seattle, Washington: Seattle Audubon Society. ISBN 978-0-914516-11-8. ^ "Riparian Vegetation Along the Middle and Lower Zones of the Chalakkudy River, Kerala, India" (PDF). Kerala Research Programme Centre for Development Studies. Archived from the original (PDF) on 2009-03-19. Retrieved 2009-10-02. Nakasone, H.; Kuroda, H.; Kato, T.; Tabuchi, T. (2003). "Nitrogen removal from water containing high nitrate nitrogen in a paddy field (wetland)". Water Science and Technology. 48 (10): 209–216. doi:10.2166/wst.2003.0576. Mengis, M.; Schif, S. L.; Harris, M.; English, M. C.; Aravena, R.; Elgood, R. J.; MacLean, A. (1999). "Multiple Geochemical and Isotopic Approaches for Assessing Ground Water NO3− Elimination in a Riparian Zone". Ground Water. 37 (3): 448–457. doi:10.1111/j.1745-6584.1999.tb01124.x. Parkyn, Stephanie. (2004). Review of Riparian Buffer Zone Effectiveness. Ministry of Agriculture and Forestry (New Zealand), www.maf.govt.nz/publications. Tang, C.; Azuma, K.; Iwami, Y.; Ohji, B.; Sakura, Y. (2004). "Nitrate behaviour in the groundwater of a headwater wetland, Chiba, Japan". Hydrological Processes. 18 (16): 3159–3168. Bibcode:2004HyPr...18.3159T. doi:10.1002/hyp.5755. Wikimedia Commons has media related to Riparian forests.